Topic: Venini Bottle? Or not? 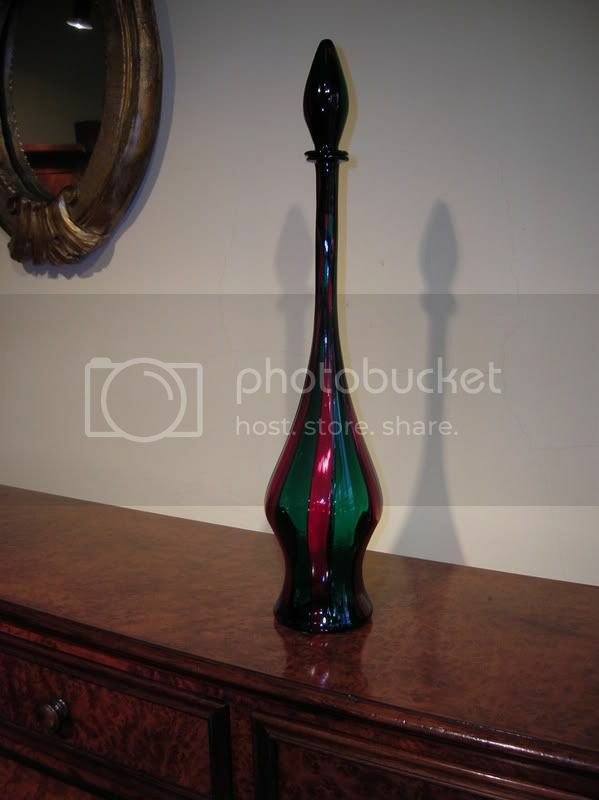 I have just bought a nice bottle at an auction, whose catalogue described it as "Venini, mid 50s, design Fulvio Bianconi". 1) The pontil is unpolished, whereas on all the Venini production it is supposed to be smooth polished from the 30s, at least. 2) Although colours and design are very Venini, I can't detect the very model on the old Venini catalogues. Re: Venini Bottle? Or not? I agree that it doesn't look right. Can you post a photo of the mark? Is there gold dust in the stripes? Hi, there is no gold dust. Actually, colours are very brilliant, stripes look like the other vintage Venini that I own, the bottle (or decanter) is very well executed. I'm trying to get some pic of the signature and I will post it.